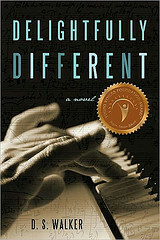 Official website of D. S. Walker, author of Delightfully Different, an award winning YA novel, that shares a glimpse into the life and mind of a girl with Asperger's Syndrome who demonstrates through her compelling experiences that every life has a purpose and that being unique is what makes each of us special. "A poignant and enlightening coming-of-age saga." Calling all parents, all teachers, all principals, all school counselors, all employers, and everyone else. Your support matters. It really does. Please help that child who seems quirky or shy or just does not seem to fit in. Please keep an open mind when that child tries to tell you why an assignment is impossible for them especially if they have done well on every other assignment. Having your support and understanding can be the difference between success and failure. Please help them to succeed.